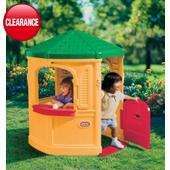 Been looking for a playhouse for my son's 2nd birthday and came across this. Flippin fantastic price as the next cheapest is Kiddicare at £110. If you order from Asda Direct they charge £9.95 for delivery however if you do what I did and ring Mothercare and ask them to price match they deliver for free. The spiel - A well appointed and cozy retreat away from the bustle and hubbub of the house! Inside there's a shingled roof and clapboard siding, as well as a Dutch door, sink and stove with an airy and well-lit feel thanks to those large windows.